André 3000 - Bio, Son, Wife, Net Worth, Height, Girlfriend, Is He Gay? André 3000 – Bio, Son, Wife, Net Worth, Height, Girlfriend, Is He Gay? You will surely remember him as one of hip-hop duo ‘Outkast’ who left millennials in awe and excitement in the 2000s with their unusual musical approach. André 3000 is a rapper, singer, record producer, and actor whose remarkable works cannot be easily forgotten. The legendary rapper has gradually qualified for the status of a veteran in the world of music and from all indications, may retire as an actor. Andre 3000 tasted the waters of the movie industry in the 90s when he featured on soap opera ‘Families’, before starring in crime drama series ‘The Shield’ in 2002. He has tasted both worlds and was exceptional in all of them. Apart from his showbiz life, there are other aspects of his life which many do not know about. Here is a brief summary of his biography. The legendary rapper was born André Benjamin on May 27, 1975, as an only child of Sharon Benjamin-Hodo. Growing up with his single mother who was a real estate dealer, he had to change locations frequently. He attended Willis A. Sutton Middle School after which he enrolled at Tri-Cities High School for the Performing Arts where his talent of rap started to manifest. While in the school he would get involved in series of rap battles, further sharpening his talent. It was during his school days that he met Outkast second, Antwan “Big Boi” Patton. They soon formed a rap duo ‘2 Shades Deep’ and went to different locations to entertain people. They were soon signed under LaFace label after an audition with its co-founder LA Reid. In 1993, they had changed their name to ‘Outkast’ and soon released their first single Players Ball which went platinum, stayed at No 1 on Billboard rap singles chart for six weeks, and also earned them’ Best New Rap Group of the Year’ at the 1995 Source Awards. By this time, André 3000 had quit smoking and adopted nicer habits to suit his career image. In 1994, their debut album Southernplayalisticadillacmuzik was released and saw the No. 3 spot on Billboard R&B/hip-hop albums chart. Their second and third albums; ATLiens (1996) and Aquemini (1998) were soon released and the duo continued to carve a niche for themselves. In 2001 another album Big Boi and Dre Present… OutKast was released, with one of its singles ‘The Whole World’ earning the duo a Grammy award for ‘Best Rap Performance by a Duo or Group’. In 2003, the duo released Speakerboxxx/The Love Below, which highlighted the individuality in music styles of the two – André 3000 and Big Boi. It seemed like an unending hiatus until 2007, when André made a return to rap. He had appeared on music videos like; Walk It Out”, and “Throw Some D’s, and some others. In November 2010, 3000 was featured on the Remix of Chris Brown’s single ‘Deuces’. He went on to make several appearances in more music videos. He also dwelt in the world of movies; in 2004, André 3000 played a role in a crime drama series The Shield. The following year, he starred in Be Cool. Other movies like Revolver (2005), Four Brothers (2005), and Semi Pro (2008) also followed. In 2013, he made a remarkable on-screen appearance in a Jimi Hendrix biopic All Is By My Side. The movie earned him the Best Male Lead nod at the Independent Spirit Awards. He also made another appearance in crime drama series American Crime in 2016. André 3000 of Outkast has a net worth estimated at $45 million which is quite suiting for a man who has left an indelible mark in the music industry. Some sources have estimated his net worth at $50 million. But either way, he fits the cap of one of most successful rappers. He also enjoys a comfortable life and makes no noise about his wealth. See Also: T.I Children, Wife, Parents, Height, Biography, Does He Have A Girlfriend? Personal Life – Wife, Son, Girlfriend, Is He Gay? Considering his age as well as his prominence on the big screens, many have quizzed into the personal life of the rapper and actor. 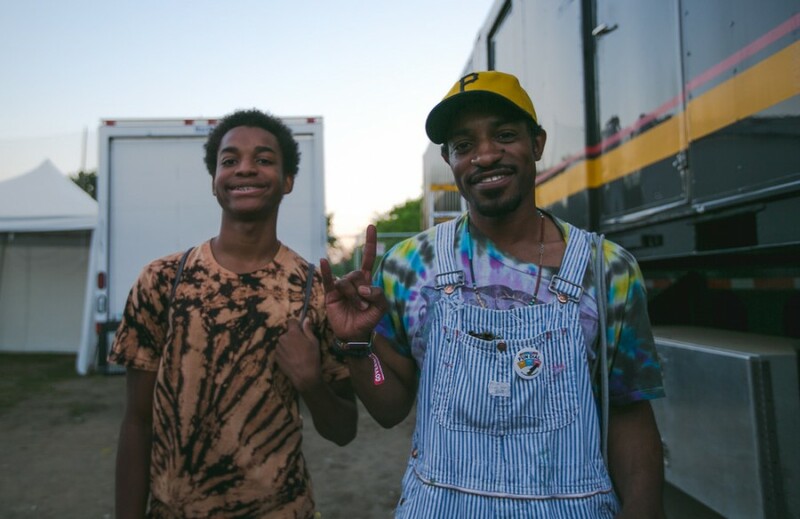 André 3000 is not married to anyone but has a son Seven Sirius Benjamin with RnB singer Erykah Badu. Seven Sirius was born in 1997 when André was dating his then-girlfriend, Badu. Things soon grew sour between the two and they parted ways a few years later. Since then, the rapper has not made any other appearance with any woman, raising speculations about his sexuality. André 3000 via Outkast, may have done a lot of songs with women but has not been seen with any. For this reason, some have given the most possible reason for his weird relationship status, and most of this reasons revolve around the notion that he could be a homosexual. However, the legendary artist has never responded to such rumors and speculations about his sexuality. André 3000’s weight did not change much over the course of his demanding career. The rapper weighs 74 kg (163 pounds) which is quite proportional to his average height of 5ft 10in (177.8 cm). 3000 has a waist that measures 35inches, which perfectly suits his chest of 50.8 inches (129 cm). He wears a size 10 (US) for his shoes.